Gifts from the Pirates: "Well, here we are: a thief, two thugs, an assassin, and a maniac, but we're not going to stand by as evil wipes out the galaxy. I guess we're stuck together, partners." "Well, here we are: a thief, two thugs, an assassin, and a maniac, but we're not going to stand by as evil wipes out the galaxy. I guess we're stuck together, partners." I'm a big kid at heart, but I like to think I'm a grown up where it counts. I love playing with the boys, they come up with amazing, fun ideas and act out all sorts of interesting role play. There's never a dull day here. By 8pm everyone's in bed though and it's time for me to flip back in to grown up mode. Some nights though we'll have been playing with the LEGO and after they've dropped off to sleep I can't seem to switch my LEGO brain off. 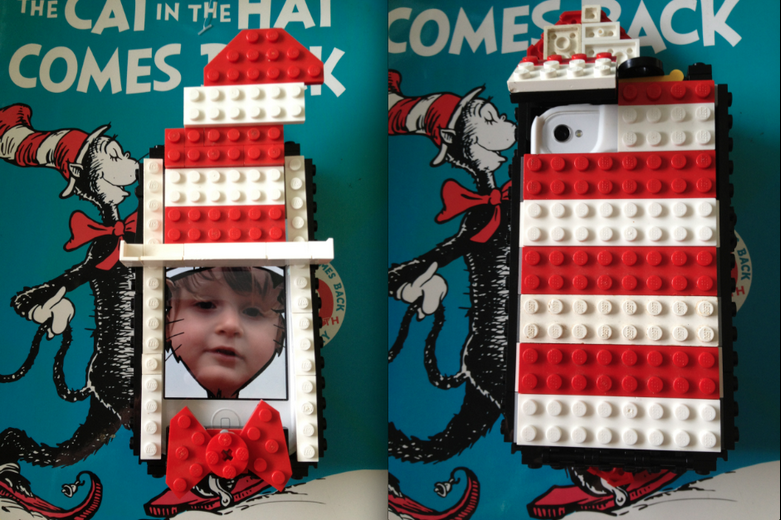 I love building fun useful items and recently me and Mrs M upgraded our phones. 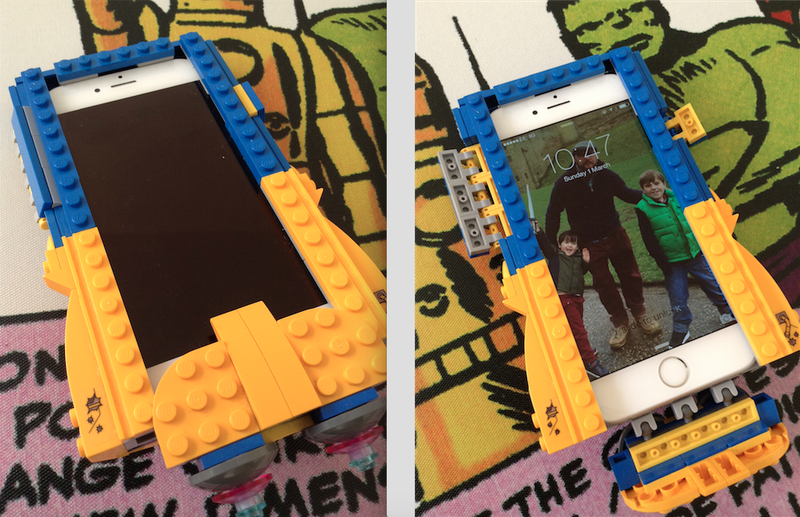 I'm not one of those people that are really in to my handset, the exciting part for me With a phone upgrade is 'new phone, new LEGO case'. 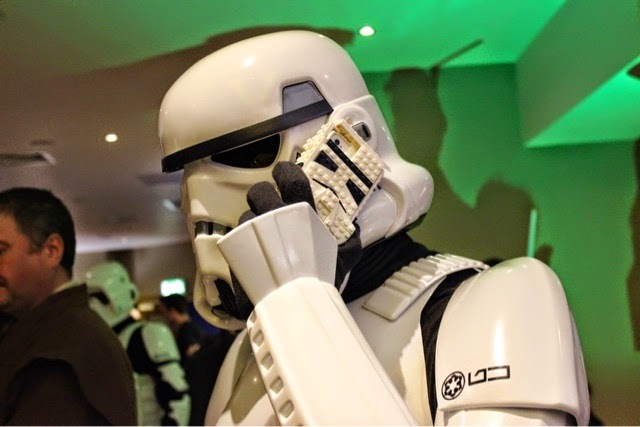 You may remember the custom jobs I built for my last handset, these included aquaman, the cat in the hat and the storm trooper case that I built for the golden brickies, photographed below with a ukGarrison Stormtrooper (strangely that case ended up being rehomed by another UkGarrison trooper). I needed this case to have the wow factor, I think it has definitely got that though after I received a phone call picking seth up from school and as I pulled it out of my pocket I saw young jaws dropping (job done). 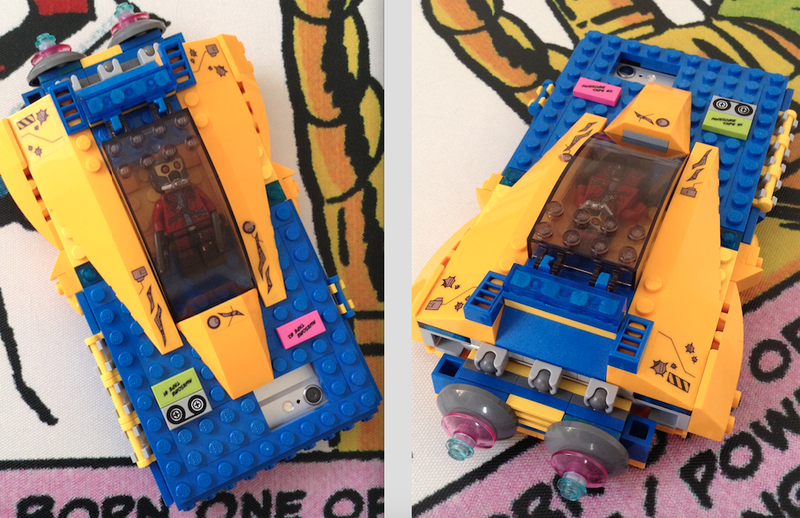 Being such a huge fan of the LEGO Guardians of the Galaxy range, I knew my new accessory needed to be inspired by the Milano. 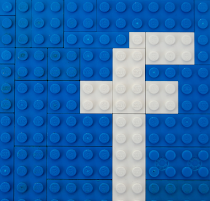 I loved the blue, grey and mustard yellow colour scheme, plus I had a few spare minifigures knocking about to possibly include. It was never going to be a scaled down version as I knew that wouldn't work as a phone case but I wanted to build a spaceship. I'm not one for tooting my own horn but the end result turned out amazing and has received loads of great comments from people out and about. Star Lord now gets to fly about everywhere I go and the boys can play with my phone without fear of a drop and smash scenario unfolding.